If you have spoken with our support representatives and they have asked you to return your KIBO for our paid repair service, then please follow this procedure. 1) Add this repair service item to your shopping cart and purchase it. Be sure to provide your shipping address during the checkout process. 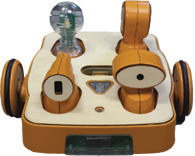 2) Package up just your KIBO body and send it to us at KinderLab Robotics, 7 Sun St., Waltham MA 02453 (USA). You don't need to include the sensors, wheels, blocks, etc, just the body of the KIBO. 3) In your package, please include a copy of the order confirmation for the repair service, or other note identifying yourself, so we'll know who to send the KIBO back to. Thank you, and please contact [email protected] with any questions.